I met João from Brazil at an intercultural training that I held for him and many other incoming exchange students a few months ago. After lunch, we met in small groups for our next workshop. Earlier, I kindly reminded him to be on time. Noticing that he usually came about 10 minutes late, I decided to talk to him about it. I was utterly confused when he insisted that he had been on schedule the whole time. We talked for a while and eventually I figured out that being “on time” meant something completely different to João than to me. During the workshop on "The Bigger Picture - The power of visual storytelling in intercultural communication" led by Joanna at the "Beyond Storytelling" conference in Heidelberg I recalled the encounter with João and found out what actually happened when we met. Joanna Sell is an intercultural trainer and coach, a holder of the certificate from the Friedrich-Schiller-University in Jena. Additionally, she has got two master degrees: in European Studies as well as in Art History. This combination led her to introduce the theme of visual storytelling to the intercultural field. Originally from Poland, she now lives in Germany and focuses on intercultural trainings for the business world. Besides running her company Intercultural Compass, Joanna is an author of the book Geschäftskultur Polen kompakt (Business culture Poland compact), a game diversophy Poland in English and German and co-author of several books on diversity and storytelling. She is a lecturer at two German universities. 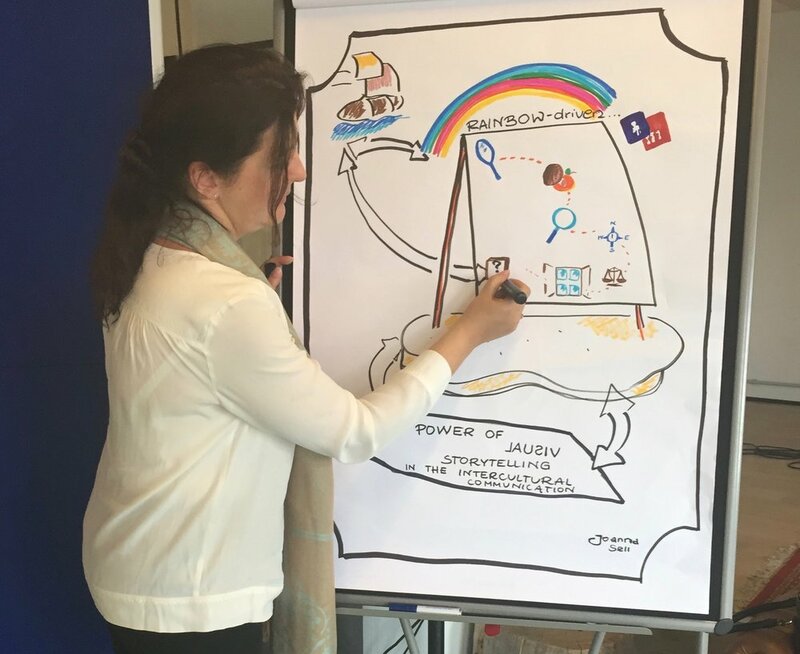 As mentioned above, at the Beyond Storytelling conference in Heidelberg she held a workshop on the power of visual storytelling in intercultural communication. That is how we met. “It’s a question of perspective change”, Joanna says. To dive into the workshop, we start off with a simple exercise: in pairs we present each other ordinary objects such as watches, jewelry or notebooks and the personal connection we have with them. Afterwards our partner outlines what links them to the certain object. The different stories we tell change the meaning of a regular watch or notebook entirely. What I take from this quick exercise is that getting our point across the way we have intended can be difficult. In the next hour, Joanna provides deep insights into how we can make sure that something is interpreted the way it is supposed to. One way is to share a particular culturally related story and describe the cultural context of that encounter. Telling a story about how I grew up with punctuality being instilled in me as an important value and the significance of being on time in Germany helps my partner to fully grasp the meaning I connect with a watch. It might have helped João when he tried to understand my perception of time and punctuality, in particular. Three steps to getting a message across without misunderstandings are necessary: describing, interpreting and evaluating. “We interpret immediately according to our cultural background”, Joanna points out. We need to remind ourselves and have the openness to accept that there are several realities and all of them are okay. If the person I communicate with interprets my words differently, that’s because they base their interpretation on a different set of stories. Hence, exchanging not only facts but also interpretations as well as explaining how we relate to something, as part of the third step, is essential. So, how do we encourage people to exchange on a deeper level? A possible way is to sensitize them to cultural differences, but also highlight similarities. When we interact with another person, we only see very few details from their cultural imprint in their behavior and the assumptions and interpretations we immediately make, originate in sometimes only one short conversation. That’s why it could be helpful to take one step back and zoom out. When we don’t focus on little details anymore, we realize that there is not only black and white or right and wrong, but there are as many “rights” as there are realities. “Zooming-out delivers an overview, a big picture where diversity is minimized” (Sell 2017). “Stereotyping and biases are “our strategy to enable us to survive in an ocean of data and facts”, but those simplifications “create black and white scenarios within seconds while dealing with other people” (Sell 2015). Even on the metaphoric level, instead of comparing coconuts with peaches, why don’t we see what they have in common? Both are about establishing a relationship and yes, it might work a little bit differently in other cultures, but we are all aiming in the same direction. “When we start exchanging stories about belonging and about identities” (Sell 2017), we widen our perception and get to see the “bigger picture”, as Joanna calls it in the title of her workshop. After all, our main objective in intercultural communication is to reinforce the positive aspects of diversity, such as happiness in the intercultural cooperation and, furthermore, to awake curiosity during cross-cultural encounters. When we do that by telling a story, we want to focus on the “happy end” and on synergy effects rather than listing possible challenges and differences. In general, “storytelling plays an important role in intercultural communication, not only because of the cognitive knowledge it includes, but also because of the so-called “silent knowledge” that can be transmitted in stories” (Sell 2017). Its focus on building relationships and emotional involvement makes a story much more effective than sharing facts and data (compare Sell 2017). My encounter with João also had a “happy end”: On the third day of the intercultural training he showed up even a little bit early to one of my workshops. When I brought it up, he smiled at me and said that he wanted to experience my concept of being on time and was kind of digging it actually because he didn’t have to squeeze in the last row for once. Pia Horst studies Educational Sciences and Anthropology at University of Heidelberg and has an university background in Business Psychology. She is interested in working with stories because they spark interest and nourish the longest time the memories of her intercultural training’s participants. She´s part of the BEYOND STORYTELLING support team. Sell, J. (2015). Power of visual Storytelling, in: SIETAR Europa Journal, September - November 2015. http://www.sietareu.org/images/stories/newsletters/SE_Journal_Sept-Nov_ 2015.pdf. Sell, J. (2017). Storytelling for Intercultural Understanding and Intercultural Sensitivity Development, in: Chlopczyk, J. (Hrsg. ): Beyond Storytelling. Berlin: Springer Gabler 2017, 223-250.